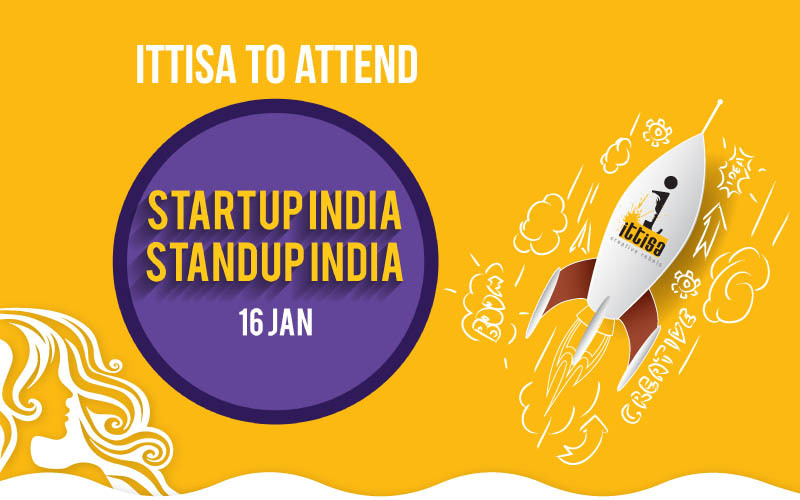 Ittisa is proud to have been invited for the government of India’s ‘Start up India’ movement, to be launched on 16 January 2016 in New Delhi. Home » Blog » Brand • Digital Marketing » Ittisa is proud to have been invited for the government of India’s ‘Start up India’ movement, to be launched on 16 January 2016 in New Delhi. What is Start up India, you ask? It is the biggest start up convention of the year attended by the best start ups in the country (over 1500) that aims at celebrating the entrepreneurship spirit of the country’s youth, the closing session of which will be addressed by our very own Prime Minister, Mr. Narendra Modi. This non-stop day-long start up global workshop on start-up entrepreneurship will include panel discussions and talks from important dignitaries from key government ministries and departments, answering questions pertaining to how government will be creating an enabling eco-system for start-ups. Not only do we get to engage in discussions with the best and the most important in India, we get to attend talks interactive talks with global leaders and venture capitalists such as Masayoshi Son (Founder and CEO, SoftBank), Travis Kalanick (Founder, Uber) and Adam Nuemann (Founder, WeWork). Google will be conducting an innovative session titled “Launchpad Accelerator” which will involve live pitches being made by early stage start-ups to potential investors. Apart from these a session on “Show Me the Money: How do we Capitalize Entrepreneurship?” will be chaired by Minister of State for Finance Jayant Sinha. This will be the launch pad of the initiative that Mr. Narendra Modi had mentioned in his last ‘Mann ki baath’ radio programme. The plan introduced at the event shall highlight the steps and measures that the government will take up to reinforce the its efforts towards creating a nurturing ground for start-ups in India. Considering, the importance of such an event towards start-up culture, the whole event will be broadcasted live in IITs, IIMs, NITs, IIITs and Central Universities and to youth groups in over 350 districts of India. So don’t forget to look out for our effervescent CEO Sneh Sharma! This is a definite cheer up for the entire Indian start-up community, there is hope for all those wishing to start their own business with a promise of benefits from the government. With Karnataka being at first place to come up with a start-up policy, we eagerly look forward to what this nation-wide initiative has in store for firms like ours. Lastly, we are thrilled and grateful to have been invited to such a prestigious event by SheThePeopleTV. We hope to acquire as much as we can through this day-long educational workshop. With heads held high and fingers crossed, here we go!